LBPD Public Information Officer Shaunna Dandoy says that on Feb. 28 at about 9:53 p.m., officers were sent to the area of LB Blvd./20th St. regarding a person-hit shooting and found a man (adult) with a non-life-threatening gunshot wound. LBFD transported him to a hospital; LBPD says it's investigating the shooting as possibly gang related. As previously reported by LBREPORT.com, shortly after 5:00 p.m. the same day a woman (adult) and a 17 year old boy were shot in a garage fronting an alley in the area of 11th St. between MLK and Lewis Aves. A car drove through the alley; some person(s) in the car fired shots at the pair; the woman survived; the boy didn't. Three days earlier (Feb. 25) gunfire flew at about 11:15 p.m. along LB's Retro Row (casings found on sidewalk but no persons hit) along 4th St. just east of Cherry Ave. That followed five shootings (including a homicide, two hit shootings and two no-person-hit-shootings from 11 p.m. Feb. 23 through the 3 a.m. hour Sunday Feb. 24. 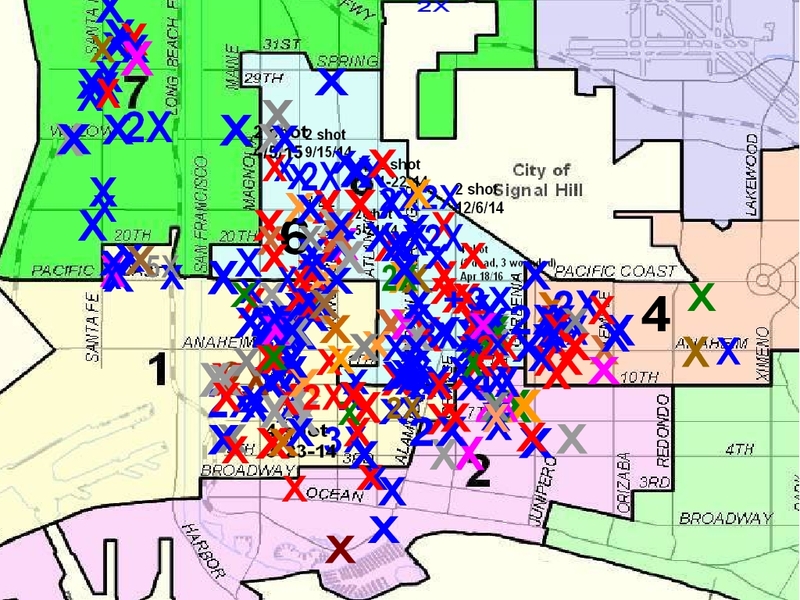 Jan 1, 2018 to date: Red Xs=homicides; Blue Xs= shootings, person wounded; Brown Xs=shots fired at victim(s), not hit; Purple Xs=shots at occupied residence/vehicle; Green Xs= shots at unoccupied vehicle/residence; Grey Xs=shots fired (no hit, no target identified); Orange X's=non-fatal stabbings; Blue * asterisk=victim hit, police unable to locate crime scene. Map is unofficial. 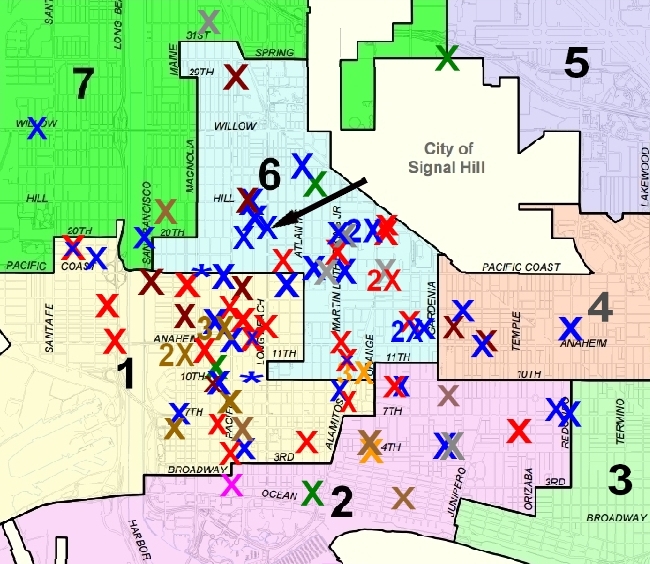 A separate map (not shown here) shows shootings in NLB.